From the Start screen, open the Travel app. Select the Shows Options button. In some cases, the Travel app being one of them, you can choose App Commands on the drop-down menu after selecting the Show Options button. 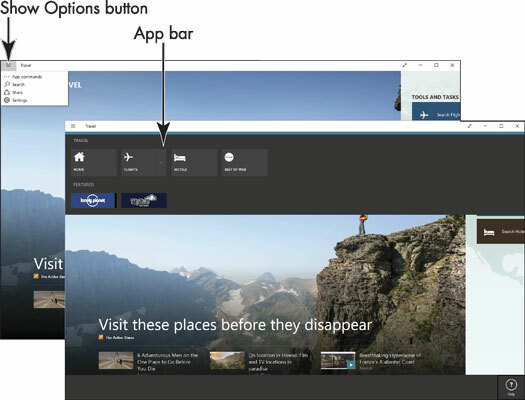 The figure shows the app bar in the Travel app. The app bar may appear across the top of the screen, the left side of the screen, or in both locations. In the Travel app, the app bar leads you to travel-specific functions. Select the Flights button on the app bar, which then disappears. Your browser opens so that you can investigate flight destinations. Display the app bar in Travel again. Then select the Hotels button. Again, your browser opens, and this time you go to a website for investigating and booking hotel rooms. Display the app bar again and take notice of the Home button. Wherever you travel in an app, you can return to the app home screen by selecting this button. In most apps, you can select the Back button (an arrow in a circle) to return to the previous screen you viewed. The Back button is found in the upper-left corner of most screens.